Veteran driver Curtis Gerry of Waterboro continues his breakout summer with the biggest victory of his career. Veteran driver Curtis Gerry of Waterboro continues the hottest streak of his career with his biggest win. OXFORD — Until this season, Curtis Gerry had never won a Super Late Model event in his long racing career. Now, he has won the biggest one in the region. 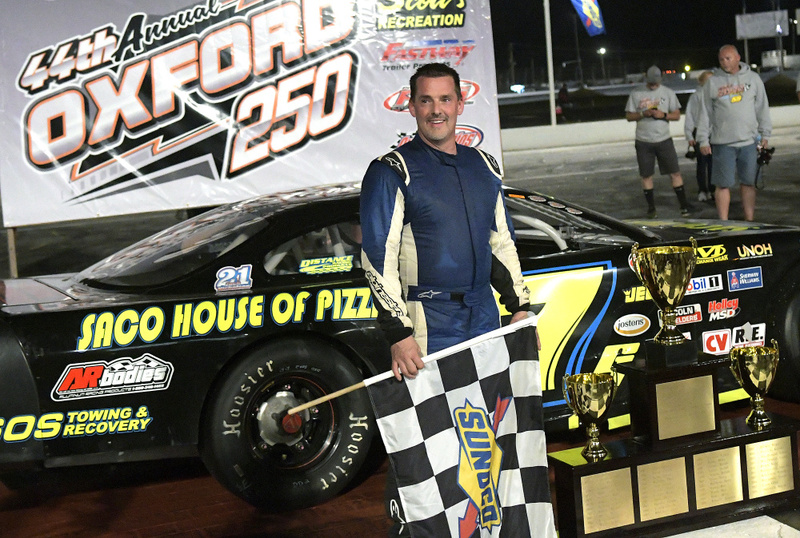 Gerry, 46, of Waterboro, led the final 53 laps Sunday night at Oxford Plains Speedway to win the 44th Scott’s Recreation Oxford 250. Gerry held off two-time champion Eddie MacDonald on three restarts in the final 30 laps, then outraced Reid Lanpher of Manchester and pole-sitter Cassius Clark of Farmington after MacDonald dropped back to fourth. Lanpher, 19, finished second for the second time in three years, and Clark was third. MacDonald and Mike Rowe, both multitime Oxford 250 winners, completed the top five. The race featured 17 caution periods, 11 of those before the halfway mark. It muted strategy throughout the middle stages of the race as drivers were unwilling to give up track position. Clark, who led a race-high 122 laps, yielded to Gerry at the exact midpoint as the race went into its longest green-flag run until Lap 172. At that point, every contending driver opted to hit pit road for fresh tires under a caution flag, restarting the race behind a half-dozen drivers who opted to stay out. When Gerry restarted on Lap 173, he was in 14th place. Seven laps later, he was third. “The car was spot on when we took off for the green. I had my doubts, but …,” said Gerry, who at one point went from seventh to fourth in one turn. It wasn’t until Gerry’s charge that the race finally started to shake out. He grabbed the lead for the second and final time on Lap 198 and avoided the mess that everyone else was navigating through behind him. Clark spun while trying to make his way back into the lead and was forced to pit for two right side tires. He climbed back into third place, but his charge stalled as the laps dwindled. Lanpher lost a lot of track position on the Lap 172 stop when pit road was blocked by three cars as he came in for tires. He had to wait for them to move, and restarted deep in the field. For Gerry, the win was years in the making. He earned his first track championship in 2016 at Beech Ridge Motor Speedway in Scarborough without winning a race. He began his Super Late Model career with more than 50 starts in the Pro All Stars Series but didn’t have a top-five finish. Everything changed for Gerry this summer when he finished on the podium in a PASS race at Beech Ridge. He turned that momentum into three wins in a four-week stretch in weekly competition at Beech Ridge, and he opened Oxford 250 weekend by setting the fastest time in Friday’s three-hour practice. He never relented after starting 21st in the 44-car field. “I drive the same way. I may be a little more aggressive, but that comes with a faster car,” Gerry said. None better than Sunday night.